Alien-contact tale in which humans are at least as weird as the aliens. Eighty years from now, denizens of Earth become aware of an alien presence when the sky fills with bursts of light from dying Fireflies, tiny machines that signal to a supergiant planet far beyond the edge of the solar system. 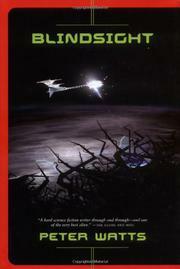 With orders to investigate, the vessel Theseus carries an artificial intelligence as its captain, along with expedition leader Jukka Sarasti, a brooding, sociopathic and downright scary vampire; Isaac Szpindel, a biologist so mechanized he can barely feel his own skin; the Gang of Four, a schizophrenic linguist; curiously passive warrior Major Amanda Bates; and observer-narrator Siri Keeton, a synthesist with half a brain (the remainder destroyed by a virus) enhanced by add-ons and advanced algorithms. They meet a huge alien vessel that calls itself Rorschach and talks eagerly but says nothing of consequence. Indeed, the Gang of Four suspects that the alien voice isn’t truly sentient at all. As Keeton begins to hallucinate, Sarasti orders a team to break into the alien vessel despite its lethal radiation levels. Still unable to decide whether the aliens are hostile, Sarasti devises a plan to capture one of the creatures that apparently thrive within Rorschach’s peculiar environment. They succeed in grabbing two specimens. These scramblers, dubbed Stretch and Clench, resemble huge, bony, multi-limbed starfish. They have no brains but show evidence of massive information-processing capability, which brings Theseus’ crew to the crucial question: Can intelligence exist without self-awareness? Watts (ßehemoth: Seppuku, 2005, etc.) carries several complications too many, but presents nonetheless a searching, disconcerting, challenging, sometimes piercing inquisition.